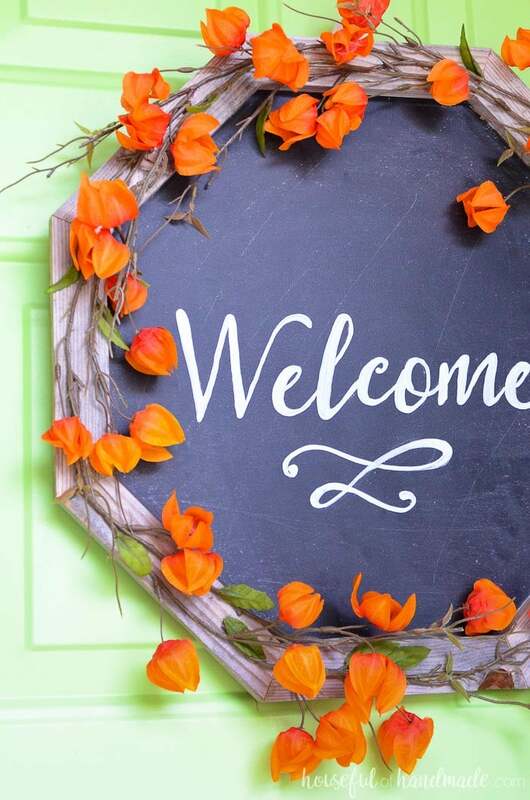 Make a beautiful chalkboard wreath out of reclaimed wood to welcome your guests to your home. 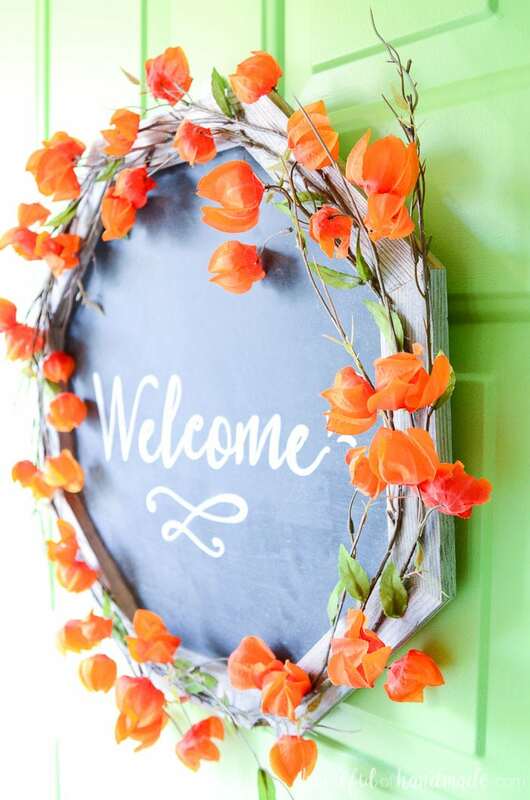 This rustic framed chalkboard is the perfect wreath for any season. 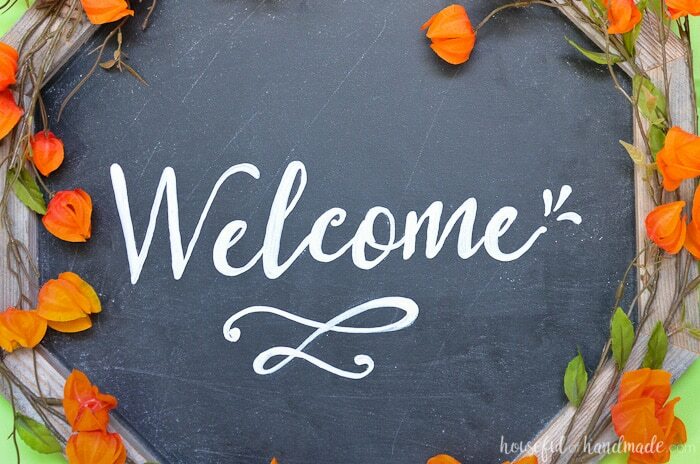 A chalkboard wreath is perfect for being able to change up your welcome message whenever you want. This reclaimed wood chalkboard wreath is easy to make from scraps of old wood. The reclaimed wood is the perfect background for a rustic floral wreath. 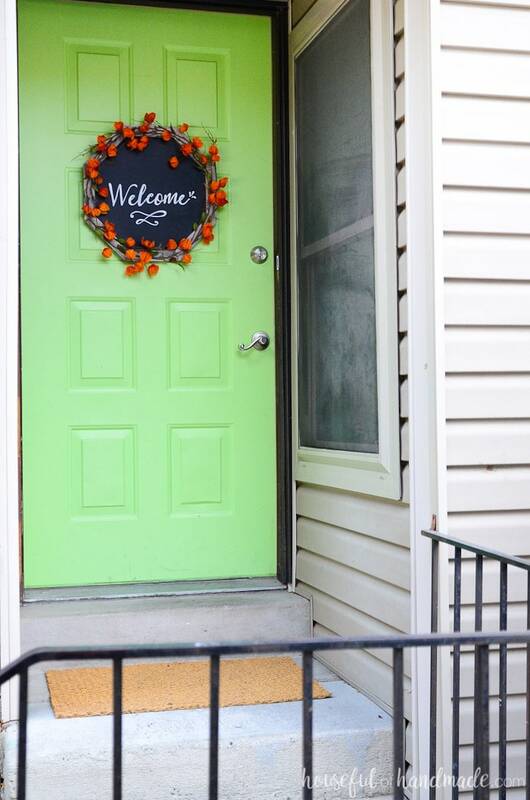 I added beautiful orange flowers to add fall warmth to my front door this season. I love using wood to create wreath forms. They are super easy to make. Use up the scrap wood that is taking over my garage. And wood wreath forms add beautiful rustic charm to any wreath. That is why I have used them for my Christmas Card Wreath, Spider web Wreath and Woodsy Fall Log Wreath. If you can make a hexagon or octagon (which is really quite easy), you can make a wood wreath form. 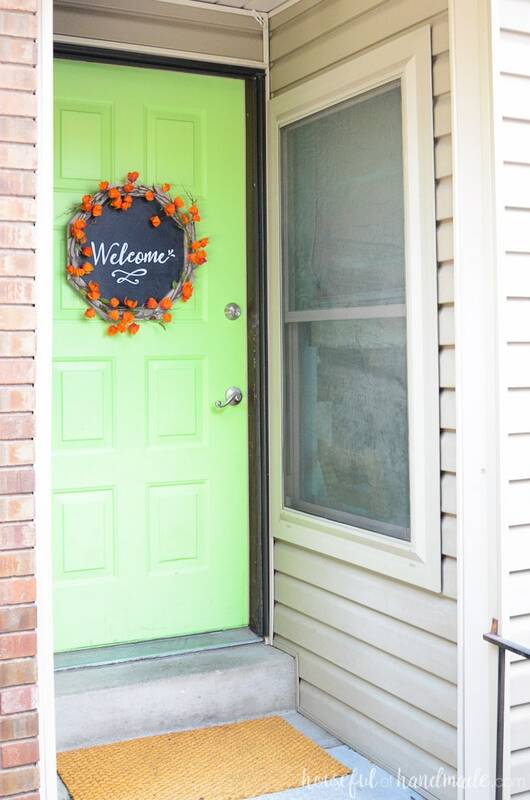 Since I still have two buckets of reclaimed 1×2 boards (even after using them for so many reclaimed wood projects), I decided it would be the perfect wood to use to create a chalkboard wreath for our front door for fall. I love how the reclaimed wood wreath turned out too. It’s the perfect mix of rustic and floral and fall and warmth. Absolutely perfect for fall! For the last couple wood wreaths, I made hexagons. But I knew I wanted this wreath to be more of a round shape, so I decided to make an octagon wreath form for it. The only difference is the angle that you cut the boards at. Figuring out the angle needed to create any wood shape is easy. You need to first divide 360 by the number of sides you want. In this case it was 360/8=45. Then you cut each board at 1/2 that number on each end. So for an octagon, you cut 8 pieces of wood with 22.5 degree angles on both ends. Make sure the cuts angle together at the bottom and when they are attached all the way around you will have your wooden octagon (or whatever shape you are making). See I told you it was easy! Once I had my cut plan, the thing that took the longest was waiting for the 2 coats of chalkboard paint to dry. This framed chalkboard wreath came together so fast, but looks so amazing. And since the back of the wreath is a real chalkboard, I can change out the message whenever I want. Maybe before our guests arrive for Thanksgiving I will change it to say Give Thanks or Gather. 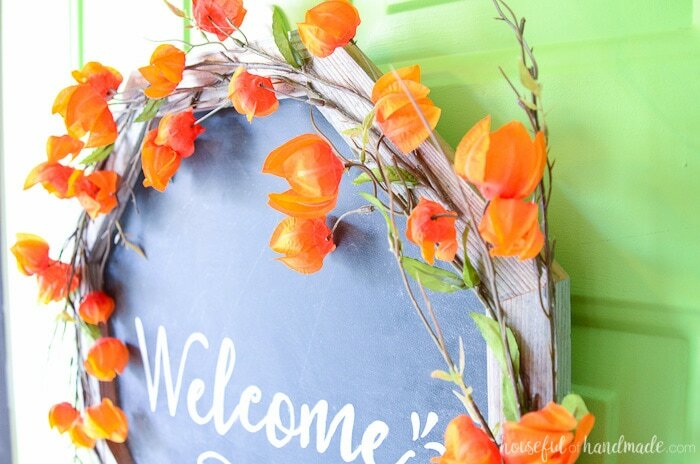 The rustic chalkboard wreath would also be perfect a wreath in the house. It would be beautiful as the center of a family gallery wall. The chalkboard message changed for the seasons. There are so many places you could use this beautiful framed chalkboard wreath. Maybe I need to hurry and make a few more! 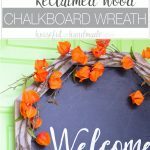 If you want to make your own reclaimed wood chalkboard wreath, click the arrow below for the tutorial. And don’t forget to check out the rest of my DIY Decor Tutorials. That is gorgeous! Love the blackboard with the old wooden frame and the Chinese lanterns (?) look fantastic. 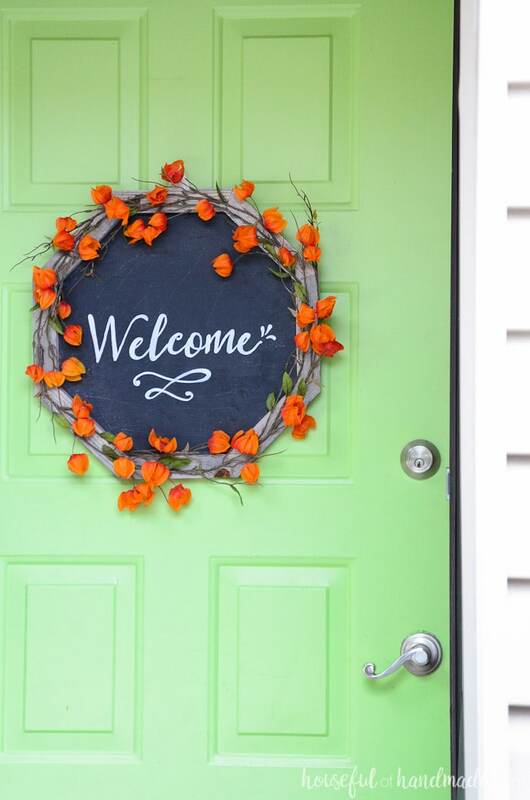 They really pop against your green door. What shade of green is that? Love it! Thanks so much Barb! Yes this is my first book. So excited to share it soon. Gorgeous Orange for Fall and Thanksgiving. Look forward to your book! Congrats! First one?